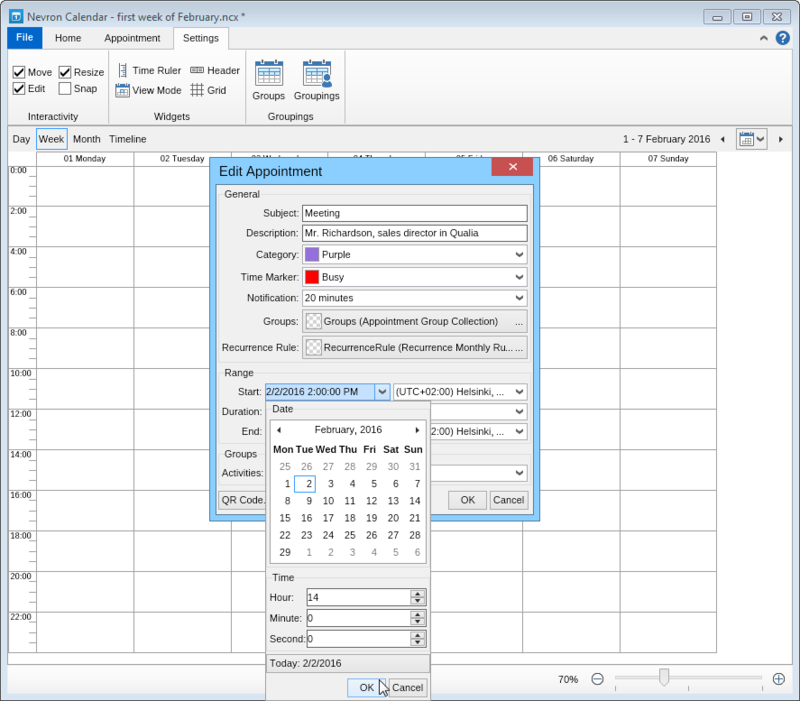 Learn how to format your Nevron Calendar! 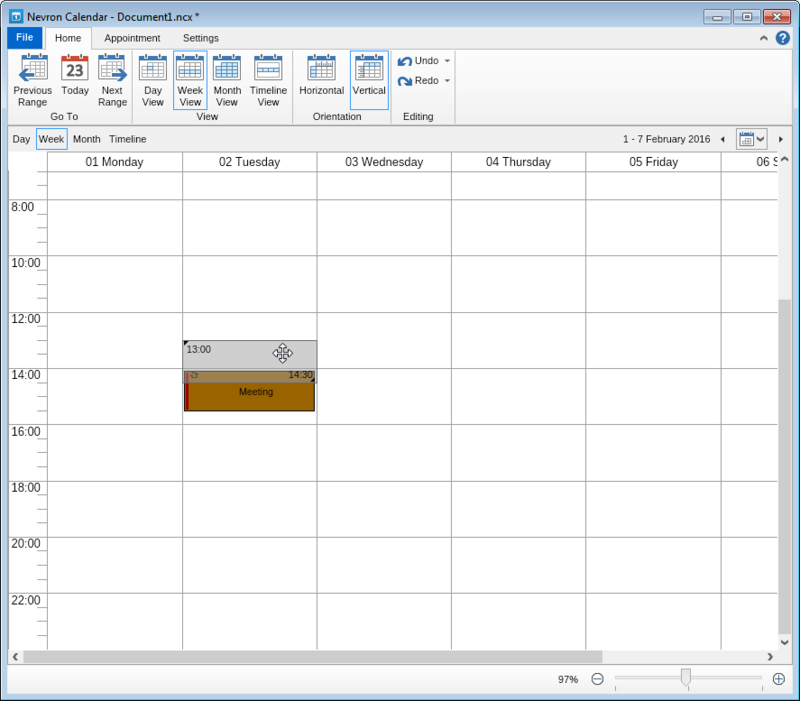 Calendars are meant to help you create and organize your schedule. 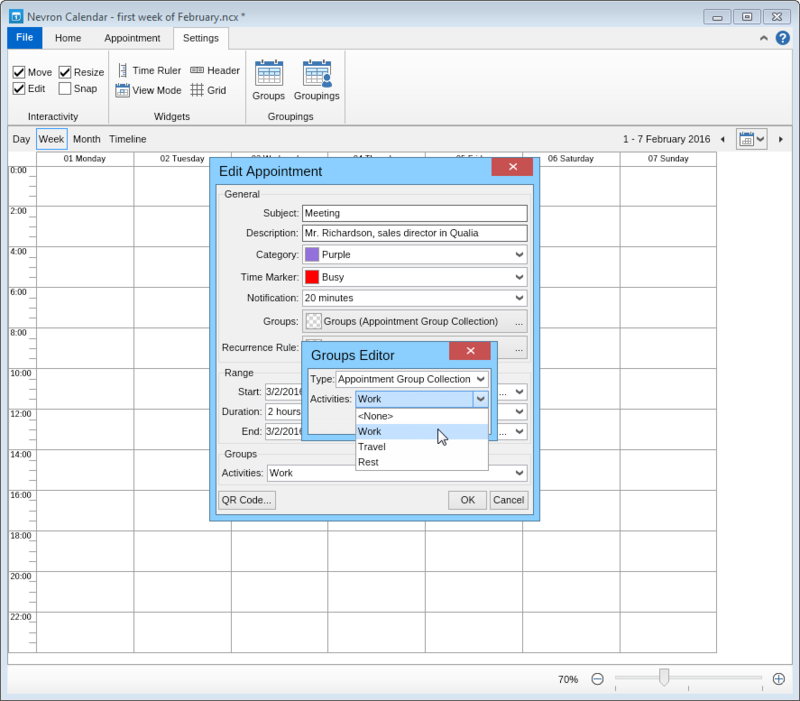 For this purpose whether you prefer to double click, right click or go to the "Appointment" tab on the ribbon and select the "Add +" button you will reach the "Add Appointment" window, with the help of wich you can specify every single aspect of your event. 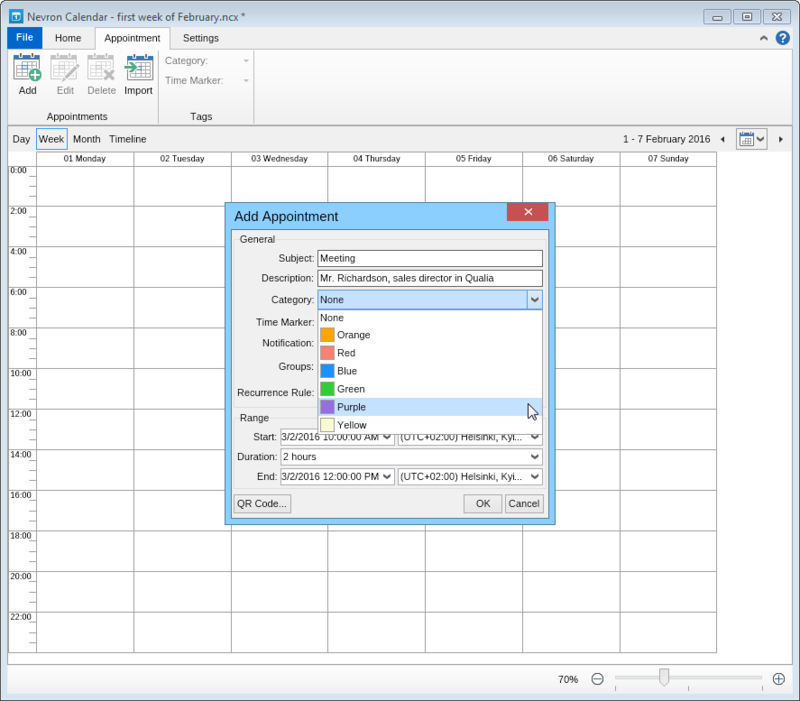 The first line of the appointment window called "Subject" lets you type a general name of your event. The name you choose will be displayed on the grid. 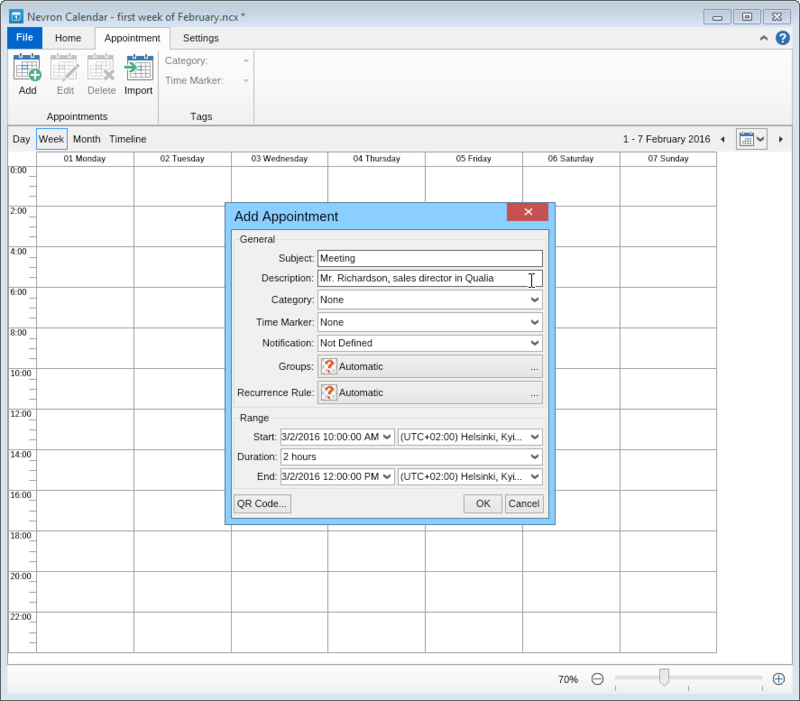 You can also add a "Description" to your appointment where you can add additional information to the event you don't want to be displayed on the grid. 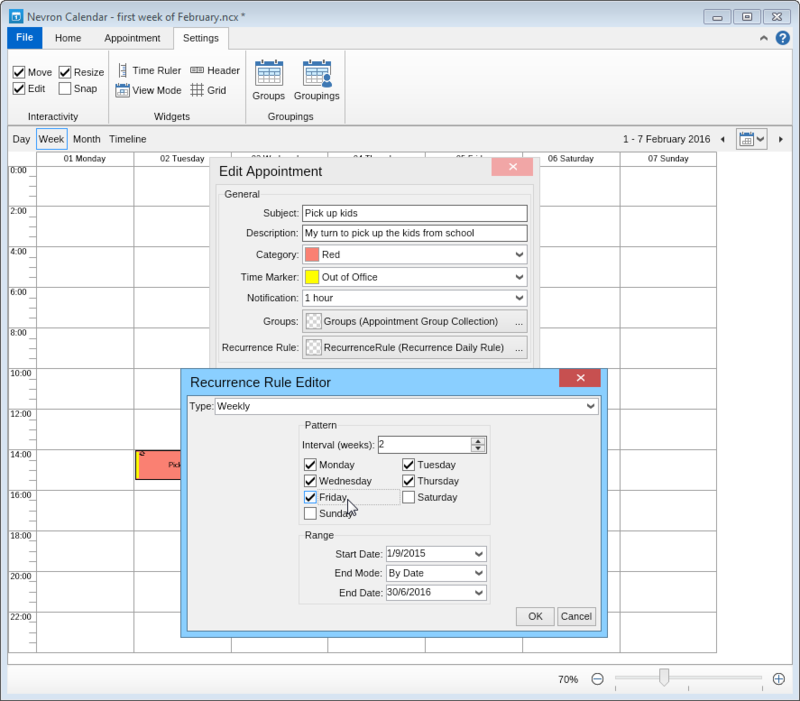 You can choose a different color for the various events from the category drop down list. The time marker represents the character of your event availability. 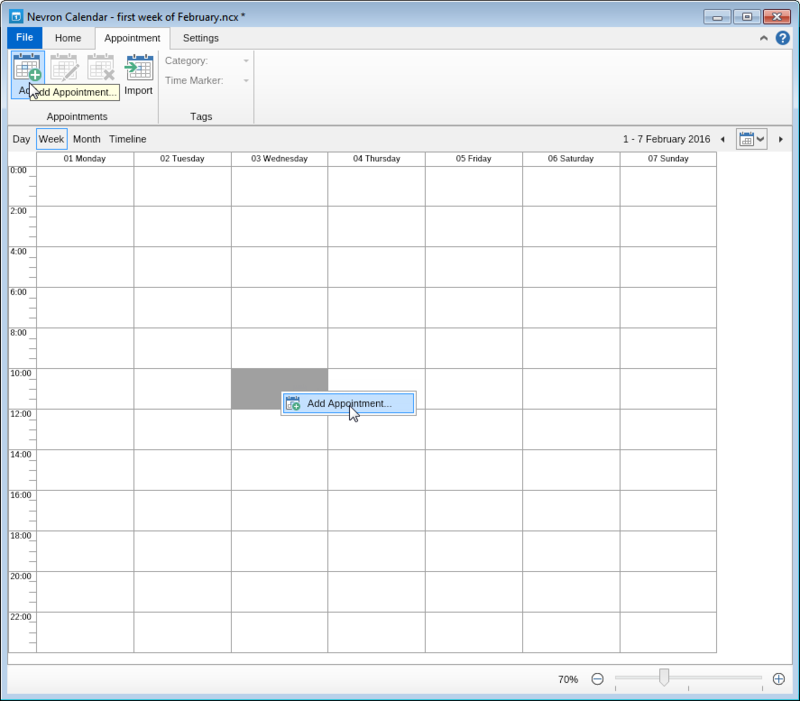 Never miss any important event of your schedule. Set the notification to remind you in the most convenient time for you. 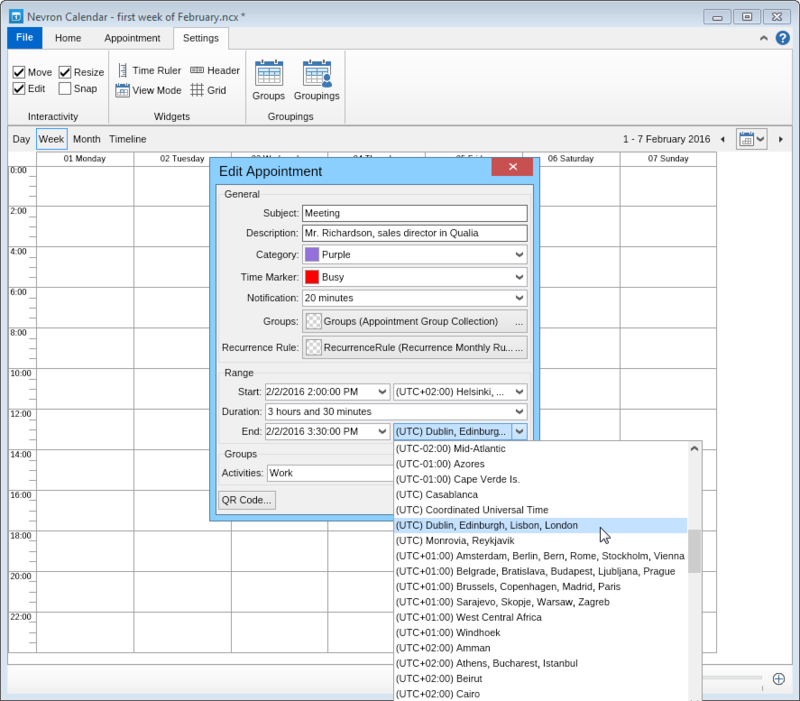 Nevron Calendar allows you to choose a group of which your appointment is a part. 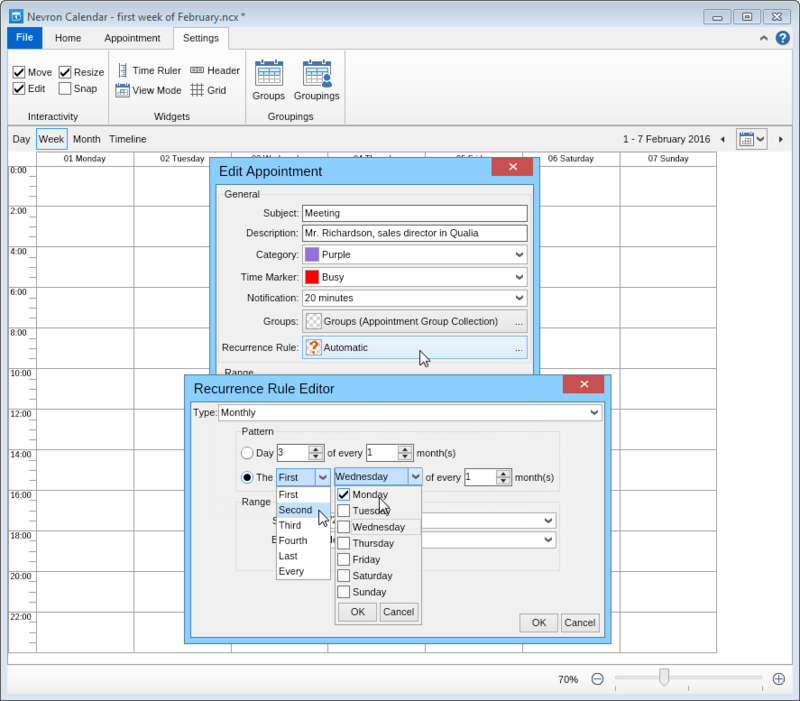 The Hourly recurrence rule allows you to set the pattern by specifying the interval of the event frequency in hours. 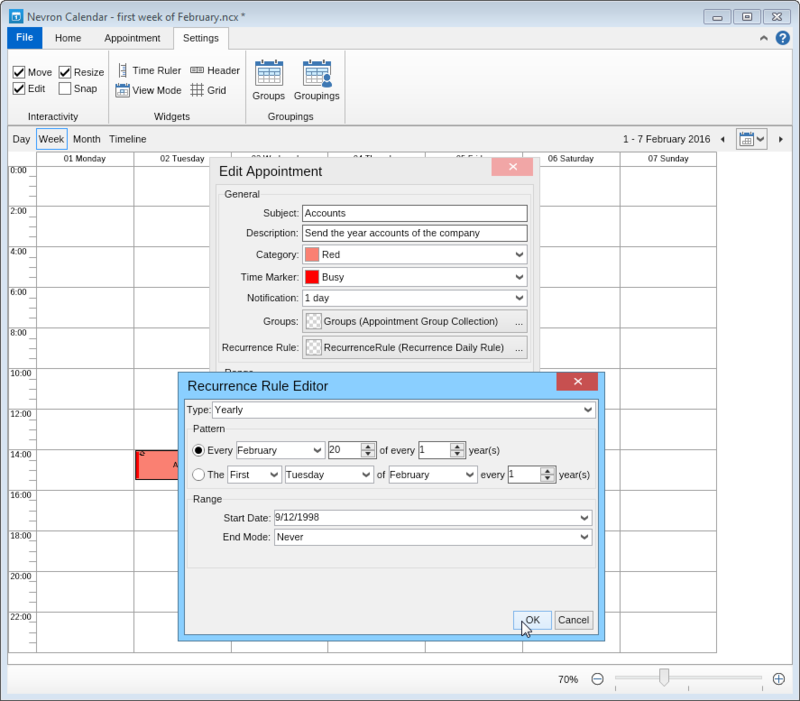 The Daily recurrence rule has analogical to the hourly recursive rule settings. 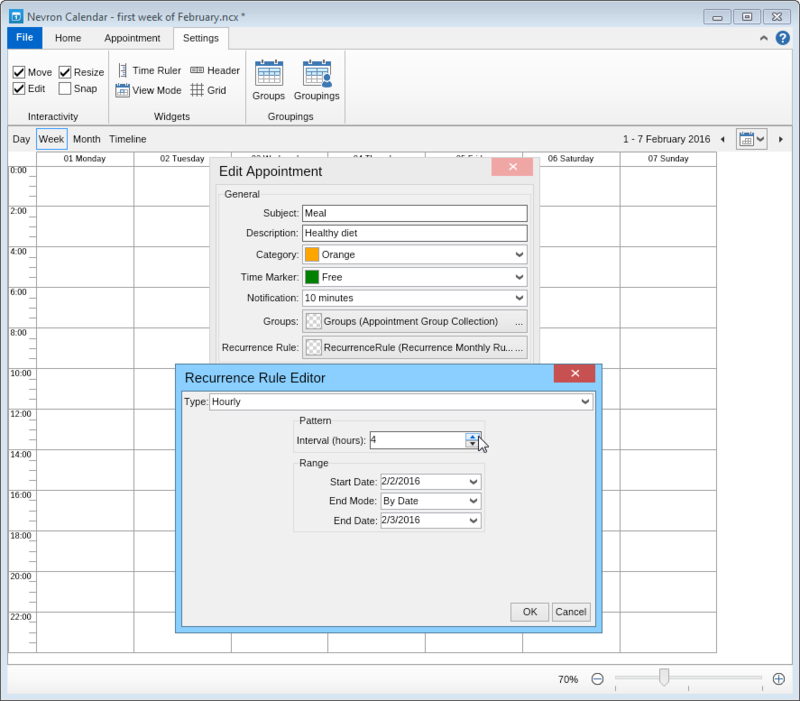 The Weekly recurrence rule includes the setting available for the daily and hourly recursive rule, and it also lets you choose the days to which you would like the appointment to apply to by ticking check boxes. 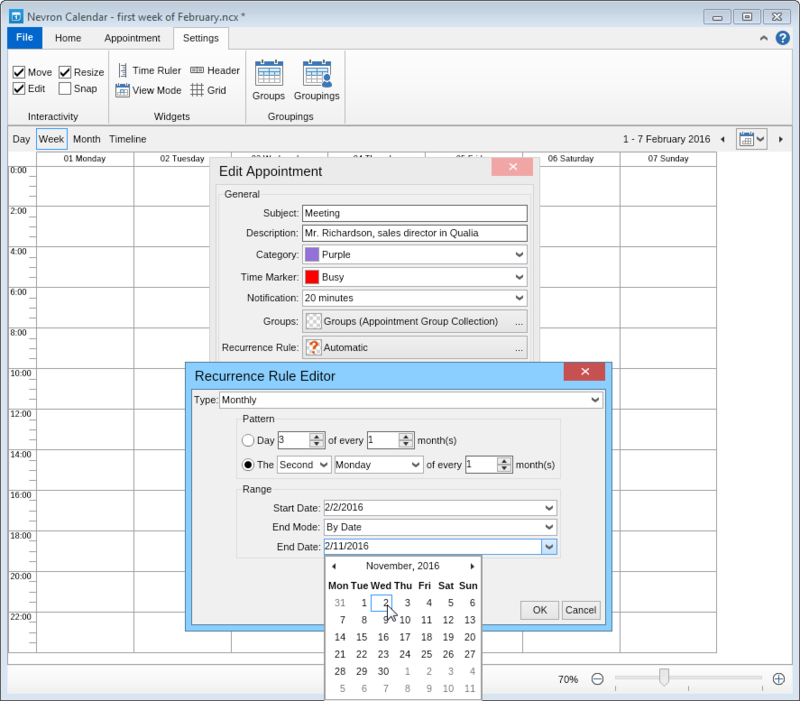 The monthly recurrence rule allows you to either choose a particular day/days or just a date of each month. And the interval frequency by weeks. The Yearly recurrence rule lets you not just to pick the particular day/days or dates of the month of each year or number of years, but to also specify which exact months it applies to. 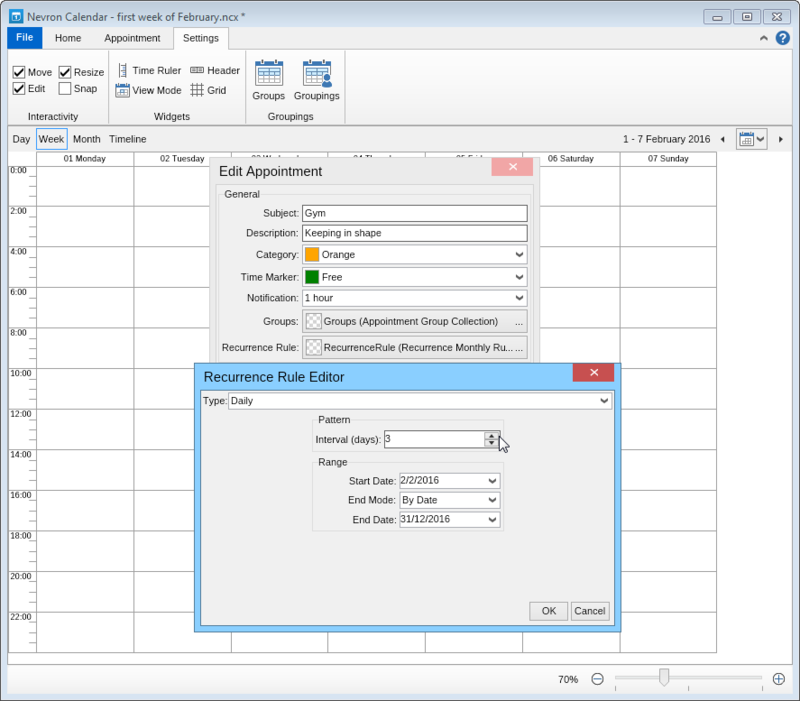 All recurrence rule types allow you to set the range of appearances of the appointment like the Start date and the End mode of it. 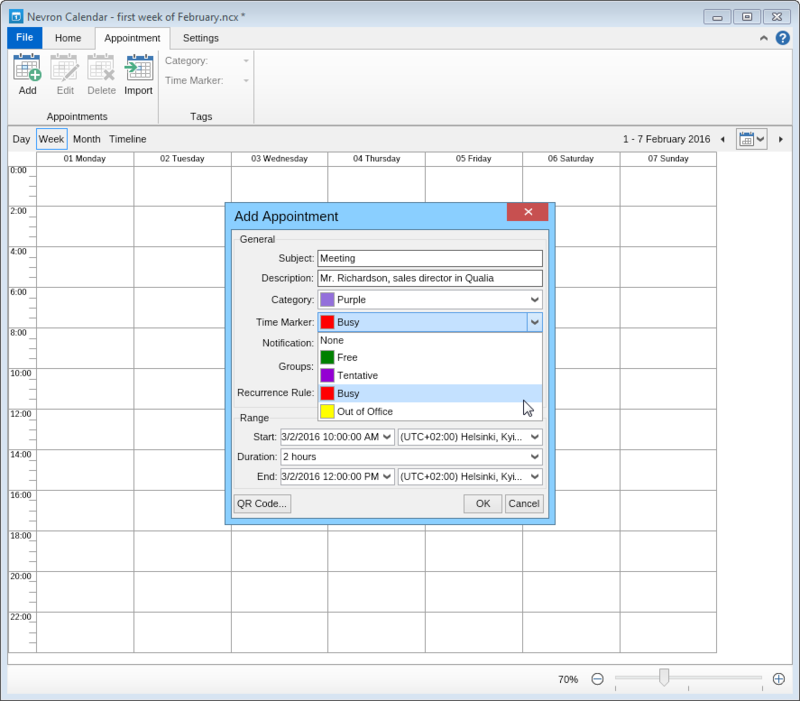 The range settings section on the appointment properties window, provides the opportunity to set the Start date and time of your appointment. You can also specify an exact time zone for each one of your events. 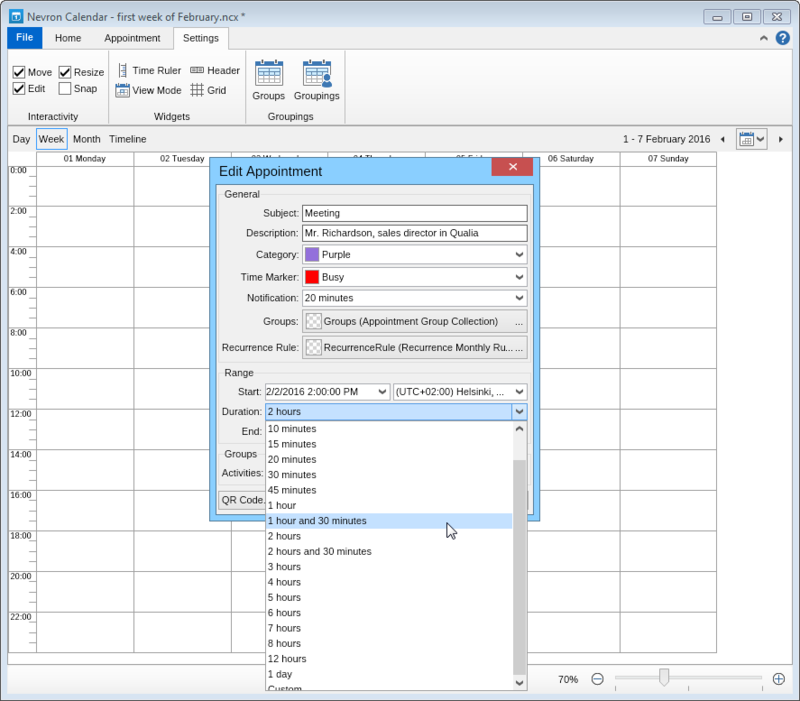 Sellect either the duration of the appointment or the end date and time. 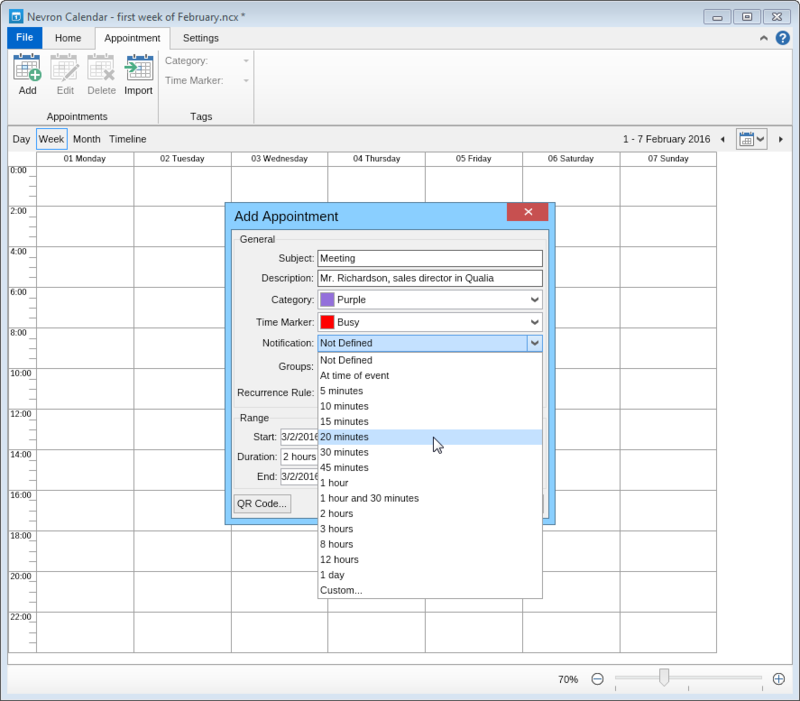 Nevron calendar also allows you to modify your appointments quickly in interactive mode, by just dragging and resizing it in a grid view mode. Synchronize all your devices. 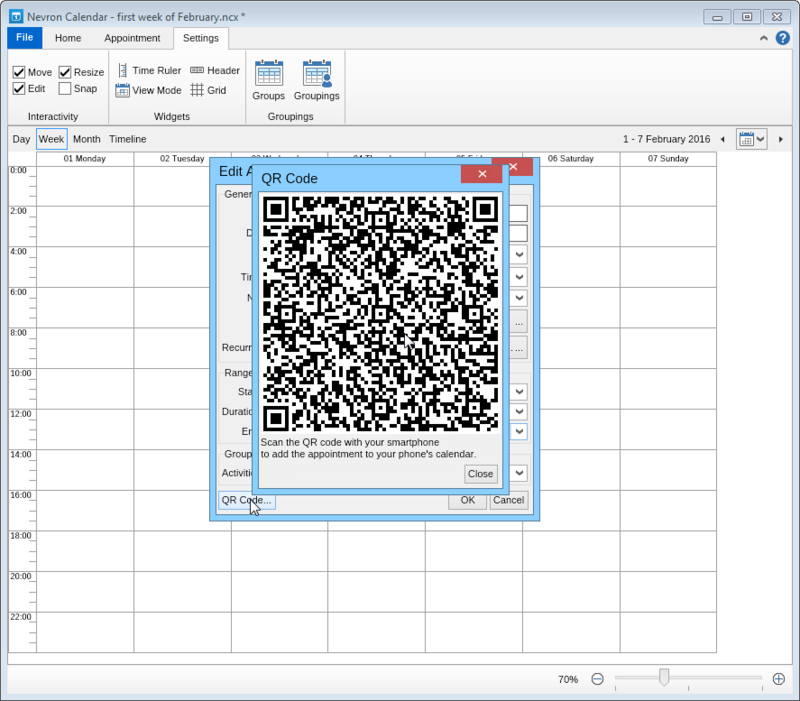 Click the QR Code button and scan the barcode with your phone to automatically add it to your phone calendar.